Nelly Martin-Anatias earned her doctoral degree at the University of Wisconsin-Madison (UW-Madison), USA, in August 2017 majoring in Second Language Acquisition (SLA). 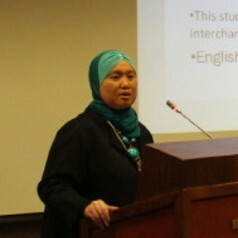 Her research interests include but are not limited to language and identity, code-switching, translanguaging, textual analysis, discourse analysis, popular texts/culture, sociolinguistics, Indonesian studies, World Englishes, Indonesian-English variants, and Teaching English and Indonesian as second/foreign languages. Prior to her Ph.D. career, she received her master's degree from the Department of Linguistics, Ohio University, USA, and pursued her undergraduate study at the State University of Jakarta, Indonesia. She is a sociolinguist by training. Currently, she is an honorary visiting scholar at the Institute of Culture, Discourse, and Communication, Auckland University of Technology (AUT), New Zealand.